Casey Stoner extended his incredible qualifying record in Valencia today, the Aussie notching his ninth pole position to deny home favourite Dani Pedrosa. 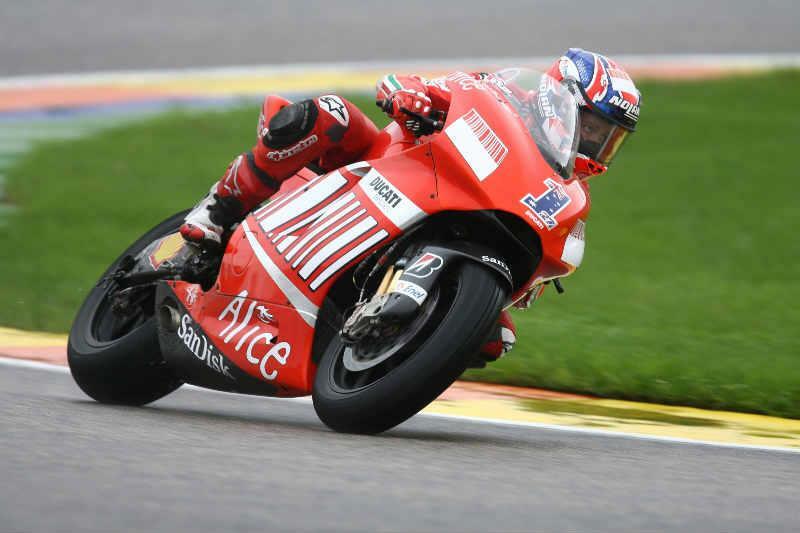 The 23-year-old equalled the season record for the number of pole positions with a best time of 1.31.502 as the factory Ducati rider shrugged off yet more niggling pain from his damaged left wrist. Stoner’s best time was good enough to survive a late attack from factory Honda rider Pedrosa as he looks to end 2008 with his sixth win of the campaign. Reflecting on another dominant qualifying performance, Stoner said: “There was a little but of rain in the middle of the session and I was trying to get a decent set-up because it looks like it is going to be dry tomorrow. This was our only chance to get a decent race setting and the first couple of exits it was a bit of a disaster. "I couldn’t get the bike feeling very good and every small change I made was going in the wrong direction. We finally got the bike feeling a bit more balanced and I was able to do some good times on race tyres. "I did some reasonable laps on the qualifiers but I still think I could have gone a little bit quicker. But I’m happy given the way conditions were. It is great to be on pole again and our race set-up now is looking good. "We put a qualifier in early in case it rained but I prefer to start further back on the grid and make my way through with a decent race set-up than have no race set-up but a good qualifying position. "I stayed out on race tyres to get a bit more set-up time and it looked like I’d made the wrong decision because I went out on one exit with race tyres and there were quite a few spots of rain coming down and that would have been game over for me.